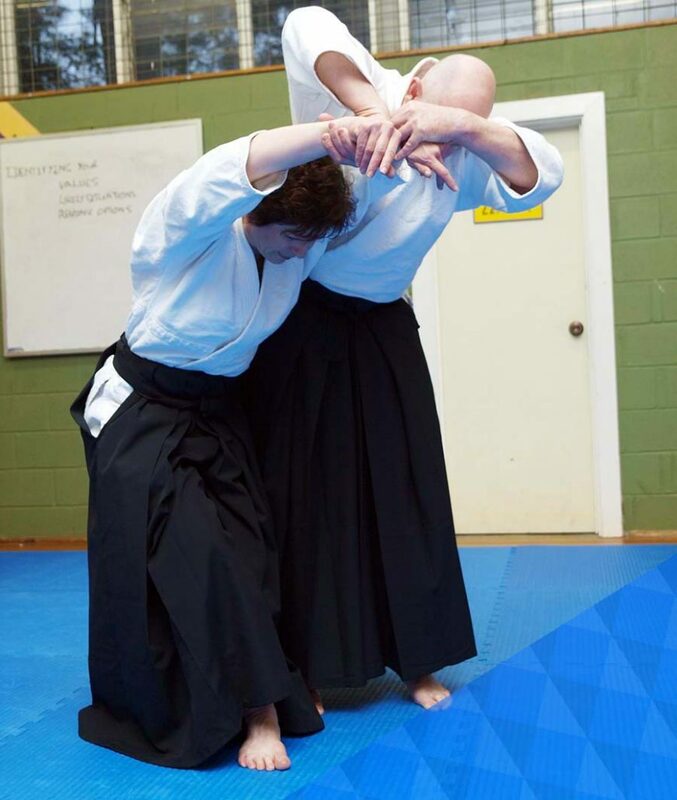 Yuishinkai Aikido is the creation of Koretoshi Maruyama Sensei, based on his many years of study with Morihei Ueshiba, the creator of Aikido, with Koichi Tohei Sensei, the founder of the Ki no Kenkyukai, and his intensive studies with several zen and ki masters. Born in Tokyo in 1936, from an early age he learnt Judo, boxing and weightlifting. In his college years he started training in Aikido, and in 1967 he became a full-time student of Ueshiba Sensei and a professional Aikido instructor. Maruyama Sensei resigned from the Aikikai in 1972 and became the Chief Instructor of the Ki no Kenkyukai, founded in September of 1971 by Koichi Tohei Sensei, 10th Dan. During this period he studied with Haruchika Noguchi Sensei in how to heal people with Ki and use Ki in daily life. At the same time, he also studied the psychology of Zen from the Zen Priest Shogen Munou, from whom he learned how to use the mind positively. Maruyama Sensei became the President of the Ki no Kenkyukai in 1990, but resigned in 1991. From this time he undertook a period of 10 years in a temple in Saitama Prefecture, intensively training in the philosophy and practice that ‘You are fundamentally Mind.’ He left the temple on October 9, 2001, during which time he had received permission from the temple to establish Aikido Yuishinkai on May 9, 1996, which he has continued to develop until the present day. Maruyama Sensei wants Yuishinkai to be “aikido without boundaries”, by which he means that it is open and welcoming to people from outside Yuishinkai. Yuishinkai has a very strong set of core concepts and methods at its heart that define the ryu, and which all instructors are required to master and teach. Yuishinkai is Maruyama Sensei’s explanation of Aikido as he experienced it from O Sensei, the founder of Aikido; it is a snapshot of Aikido in O Sensei’s later years. Interestingly, some senior teachers in some of the other aikido ryu perform aikido in a very similar fashion to Yuishinkai, implying that Yuishinkai is a view of aikido shared by others who were direct students of O Sensei. The explanations and terminology are often Maruyama Sensei’s, his way of describing what he saw O Sensei do, but which O Sensei didn’t “label”. Every teacher would say “I teach O Sensei’s Aikido”, however it has become clear that O Sensei practiced a very Koryu (old arts) approach to teaching. Everything he did was on display, but the very specific tiny movements of bones, feet, pelvis that were the core of what he did were very difficult to detect and very few saw them. O Sensei didn’t teach this inner Aikido, he expected that a few would see it, work on it and then understand by their own efforts and with some assistance from him. As a result almost everyone practices an “open” form of Aikido which looks like, but isn’t, what O Sensei actually did. This only matters if a student wants to do Aikido as O Sensei did it. There are formidably competent practitioners everywhere who have built on the “open” Aikido and become truly outstanding, some adding their own ideas and concepts. Others have experienced some of the “inner” Aikido and have been researching and re-engineering to recreate O Sensei’s Aikido. Maruyama Sensei was acknowledged by O Sensei as “getting it”, and Yuishinkai is very different to most Aikido ryu in that Maruyama Sensei is teaching the “inner” Aikido directly to all students, rather than the other approach of “the elite will figure it out.” There is no getting away from the fact that this Aikido is complex. A lot happens during a technique, both physically and ki-wise. As a result Yuishinkai provides this information in increasing detail as a student progresses. Technique levels There are four levels of understanding and practice for every technique. Their purpose is to teach basic form, moving to rapid, rhythmic movement, then adding layers of Aiki and martial Zen understanding. Footwork Rapid entry with irimi or tenkan, to omote or ura, are characteristic of Aikido. Yusihinkai teaches O Sensei’s footwork, involving small but rapid steps for stability and speed, combined in more advanced levels with a hip/knee movement called Moon Shadow that provides significant power and timing advantages. The footwork also includes special movements for various turns, and for weight transfer. Footwork also incorporates the specific ways in which the feet and body work together to connect strongly with the ground. Centrepole Aikido is often described as circular or spiraled, the triangular Hanmi kamae spinning. Yuishinkai sees this as a powerful and rapid rotation around defined axes (vertical, horizontal, tilted). Turning around the axis and pelvis in this way adds tremendous speed, power and stability, and profoundly disturbs Uke. This requires correct footwork and use of the skeleton. Yin and Yang Techniques are also accomplished with an understanding of the varying balance between Yin and Yang mind and technique as dictated by the different stages of a technique and the attacker’s reactions to your movements. Tanden Correctly moving the Tanden (centre) horizontally, vertically and diagonally at the right times dramatically increases the power of the throw and the effect upon uke. Using the Skeleton The bones in the feet, arms, shoulder-blades, legs, pelvis and spine move in particular ways to set up entries, to compress and control the opponent, to free the thrower up to move, and to generate power. Softness Softness most definitely does not mean weakness or “aiki fruityness”. Softness means several things, but basically it is the release of all tension in the body, allowing Ki in, allowing the optimum integration of mind and body in performing technique and with unifying with the universe. Yuishinkai cannot be done without it. Ki Ki training is part of the Yuishinkai syllabus. All students have to be able to do Mind in the Tanden, Relax Completely, Weight Underside, and Extend Ki under stress and movement. Students need to be able start everything with Ki is Extending, and persist with ki extension during and after every action. There is also specific Ki training within the 4 levels of technique to match mind and body to the situation each level is designed for.The Tanden Ball exercise is also vital to Yuishinkai training, it forms fully 1/3 of Maruyama Sensei’s personal daily training (the rest is 1/3 meditation, 1/3 aikido). It trains mind and body in Mushin, No Mind, which is crucial for correct Yuishinkai. Sensei also says that training correctly, i.e. consistently using all the core concepts correctly will train students in Ki. The Art of Ukemi When uke attacks nage it is with the intention of succeeding in the attack. Full commitment is required of unified mind and body – note however, that in training with less experienced partners this full commitment is performed in a way that that partner can deal with safely. Full commitment requires all the core concepts to be operating fully; it then allows uke to instantly understand what nage is doing if/when nage responds to the attack. This instant understanding of what nage is up to in turn allows either (a) uke to counter nage’s response with a Kaeshi Waza (reversal), or, (b) uke to instantly adapt and escape injury through rolling or (c) to conform with nage and teach them technique through shaping it for them, then doing rolling. All aikido techniques can be done in a throw that is safe for for the attacker, or in a way that sets up atemi (strikes) and breaks bones. As the attacker (uke) you don’t know which is going to be done until nage “tells” you via ki and technique shape, so you must be able to instantly adapt. When performing the role of nage the same full commitment is required; this leads to technique that uke cannot counter. When you can take ukemi well, then you can throw well. All the other core concepts lead to Ukemi, it is the core martial skill. You are Mind Itself This is the meaning of Yuishinkai. A basic understanding is that you are/can do what you think. This is easily demonstrated by correctly done ki tests. Further concepts involve understanding some of the historical esoteric Buddhist and Zen views. This is how Sensei sees the world. Aikido Yuishinkai was founded by Master Koretoshi Maruyama to promote universal values and principles of peace throughout the world. Students from all styles of aikido are welcome to train with us as we are non-partisan in our approach. Friendship with other dojos is encouraged in keeping with the harmonious spirit of Aikido. Aikido Yuishinkai is intended to practise ‘Aikido without boundaries’. 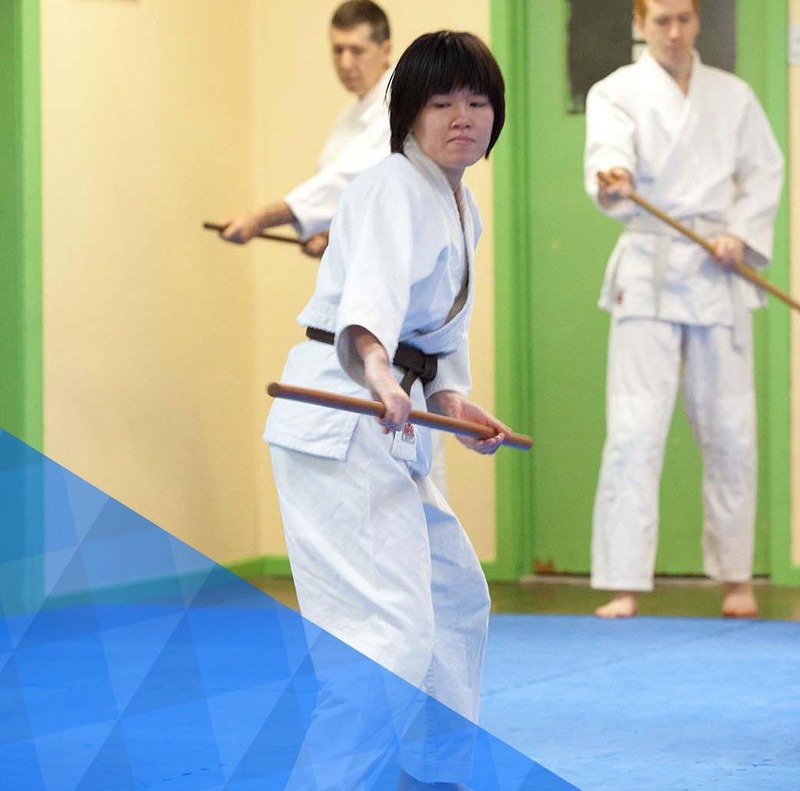 Additionally, in order to emphasise the focus on teaching the art and to avoid an overly commercial approach at odds with our philosophy, Aikido Yuishinkai has no membership fee, and grading fees are kept as low as possible. A major part of the Aikido Yuishinkai approach is based on the immediate impact the words we use have on our behaviour and outlook in daily life. If you use positive and affirmative words then those are the resulting outcomes; if you use negative words, mental images and stereotypes then your interactions and outcomes will also be negative. This is because the words we use shape, right then and there, our mindset, our energy, and those of the people we are interacting with. “Words have a power of their own. The power of the spoken word was recognised in ancient Japan as ‘kotodama’, or word spirit. To speak a word is to encourage it to come true. Your life energy responds to sounds and thoughts, as expressed in the spoken word. When you fill your daily life with positive words and thoughts, your life is filled with the power of Ki. In this way you can keep mentally and physically healthy, and have a positive influence on others as well. Words have real power, and can produce practical results in your life. I have written the following membership motto for members of Aikido Yuishinkai. I encourage you to read them aloud each morning and night to keep your subconscious in a positive state of mind. What are your earliest recollections of Aikido? 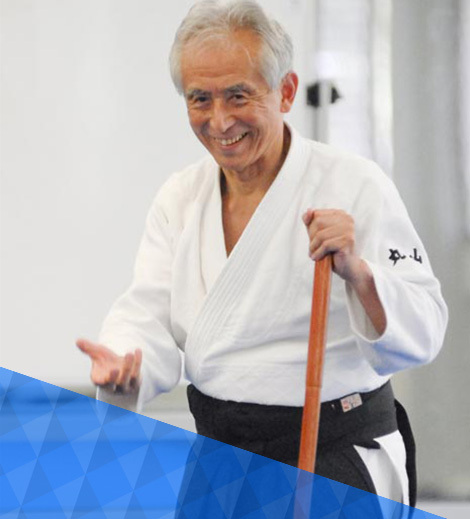 What was the most important lesson your learnt from O-Sensei? I learned many martial arts, especially Judo. These arts involved a lot of throwing and fighting. I practiced Judo to become strong. I took many classes at the Kodokan but felt the limits of Judo. Back then, the heaviest person was the Judo champion but I only weighed about 60 kg. After one Judo class, I went to a bookshop where I read a book on Aikido by Kisshomaru Ueshiba. When I read it, I was struck by the clearness of O-Sensei’s eyes. I was also attracted by the fact that there were no competitions in Aikido. Although it seemed like playing, I decided to practice Aikido. In Japan, studying at a university takes four years, so it was in my third year of study that I went to Hombu dojo. The date was 26 November. When I reached there, I found a lot of young people who were from Keio University! Back then there was no dojo at the university so they had to go to Aikikai’s dojo to practice. It was quite a coincidence since the university’s training slot was 3-4 pm and I reached Aikikai around 4-5 pm! I didn’t know them but they knew who I was. The reason for this was that I had established a cartoon club at the university a year before and had made a television appearance due to it. Tohei Sensei was the instructor of Keio University Aikido Club but he left the position to go to Hawaii. How has Aikido changed your life? When learning how to extend ki, I was also learning to keep calm. This state has changed my life. How do you see the future of Aikido? After O-Sensei died, separation has taken place in the aikido world. Some aikido schools have introduced competition. In ancient Japan, there were many famous swordsmen. One of them was Kami-izumi Isenokami of the Shinkage ryu (New Shadow School). O-Sensei learnt Shinkage ryu in addition to other martial arts. During that time, the swordsmen practiced only kata and they didn’t have competitions. They would practice one kata for two hours or more. Aikido has kata, take for example Shomenuchi Kokyunage. Today, we usually practice one technique for 5-10 minutes before changing. The swordsmen fought with no injuries. However, if any one of them fought 60 times, it would mean 60 people died – just from practicing kata. In Japan, I am teaching ki to a karate instructor. At the public gym where I teach, half the space is taken up by my class while the other half is occupied by his class. I am also teaching his students how to use ki in karate. My classes take place from 7-8:30 pm while the karate classes run from 8-9 pm. During the 30 minutes where our times overlap, the combined class practices breathing and other ki exercises. This instructor introduced me to another karate instructor who told me an interesting story. He recounted a children’s class which practiced nothing but kata from the ages of 6-12 years. They didn’t take part in any competitions during that time. However, when they did compete, the children who had practiced kata intensively won. Kata practice is very important. O-Sensei once told me that even though I knew the techniques, I must take ukemi. “Don’t resist! Take ukemi!” he said. We should return to Ueshiba Sensei’s teachings. What are the most important influences on your Aikido? During your time spent in the temple, how did your meditations help you to evolve the concept of “You are fundamentally mind”? Ki is very important. Thomas Edison, the American inventor said that the universe is filled with electricity. Lightning seemingly strikes out of nowhere but the potential is already there. Likewise, ki is like electricity. Everything is composed of molecules which consist of smaller particles such as atoms. If we continue to infinitely subdivide these particles, we will never reach zero, since you cannot make something from nothing. In Eastern philosophy, ki is defined as an infinite gathering of infinitely small things. Everything is made up of ki. When ki comes together, suns can be created. When these suns die, they return to the ki that made them. The mind is very important as it is similar to an electric generator. The mind allows us to tap into ki and to use it. I had read the teachings of Shogen Muno, a Zen practitioner and in his books he talked of “Mind makes your future”. A positive mind can have great effect on a person’s life. Kan So (positive visualization) enables anyone to positively affect their lives. One of my instructors is Tayeko Yamada, a housewife with three children. She had neither taken an airplane nor visited a foreign country. I asked her to imagine going to another country for about five minutes a day. However, she couldn’t picture this so I brought her some travel brochures to help her in her visualization. This took place in December 2001. In February 2002, Michael Williams Sensei of Australia called me and invited me to come down and give a seminar and invited any instructors that I wanted to bring along. In September that year, I arrived in Australia, along with my wife, and Tayeko Yamada. For myself, I wished to visit Hawaii. After practicing kan so for a few months, I received a call from Donald Enoki who asked me to come over for a week. This time there would be no Aikido practice so I left my keikogi in Japan! The ‘Yuishin’ in Yuishinkai Aikido means “I am mind itself”. During my stay at the temple, I meditated on being Mu (nothing). I came to realize that “now” is very important so I formed the idea of “Now be here”. Our minds have conscious and subconscious parts. In between these two parts, there is a filter. If this filter is dirty, whatever good thoughts that occur in our consciousness will become dirty when they pass into our sub consciousness. A positive mind keeps the filter clean. Could you tell us more about your philosphy on “Words have a power of their own”? The power of the spoken word was recognized in ancient Japan as kotodama, or word spirit. To speak a word is to encourage it to come true. Your life energy responds to sounds and thoughts, as expressed in the spoken word. When you fill your daily life with positive words and thoughts, your life is filled with the power of ki. In this way you can keep mentally and physically healthy, and have a positive influence on others as well. Words have real power, and can produce practical results in your life. There was a girl who was poor but pretty. She had a hard life as her parents had died when she was very young. She married a rich man but she continued to have a negative mind. Later on, her husband died in a car crash and she lost all her money and career. She died at a young age. Although good things happened to her, her mind had this “but” inside which clouded her thoughts. How has your experience with teaching Aikido in many countries helped you to establish Aikido Yuishinkai? How has your teaching of Aikido evolved over the years? What are your thoughts about the subject of not using strength in the practice of Aikido? I would like to spread kan so throughout the world since positive words lead to a positive mind which dictates your life. I have added the footwork that is used by the Shinkage ryu style of swordsmanship into the techniques taught in Aikido Yuishinkai. The footwork is known as Suigetsu-no-ashi (moon shadow foot). This allows nage to insert his foot into the ma-ai space, without any indication of movement in the upper body. This gives nage an edge. When watching a wildlife documentary, I was inspired by the image of a lizard running over the surface of a pond. Of course, human beings cannot run like that but I was able to create Tokage-no-ashi (lizard feet). The advantage of using this lies in the fact that nage’s two or three steps are faster than uke’s single step in an attack. Both pieces of footwork are usually not noticed by the uke. When they are used together, the ma-ai is shortened and a technique can be executed easily. The swordsmen of ancient Japan never jumped or twisted their bodies when practicing kata or when they were fighting. Be natural in your Aikido. I noticed this about Ueshiba Sensei. He never twisted his body nor did he jump when performing a technique. He just walked naturally. If you watch movie footage of him, you will see this. Could you share with us your thoughts about the centerline in Aikido? Imagine there is a long metal rod that stretches from the top of your head, through your spine, and emerges from the bottom of your pelvis. This is sei-chu-sen, the center line of the body which is also considered a spiritual center. To help my students keep their centerline, I ask them to visualize a very thin wall along their centerlines which cuts their bodies into their left and right halves. When they walk, they should slide the insides of their legs along the sides of the wall. Could you tell us more about the healing aspect of Aikido Yuishinkai? Noguchi said that as men began to use their brains, and because their way of living impaired their original wildness, that ability grew weak and, following the example of dogs and deer, they learnt to chew bark and lick the roots of plants and so discovered how to treat themselves with medicinal substances. “Aikido without boundaries” is one of the philosophies of Aikido Yuishinkai. Could you elaborate on the importance of this? What are your thoughts about the use of the Bokken and Jo in Aikido? When you extend ki through your bokken and jo, they become “bright”. I gave a bokken to a student of mine. I had used this bokken regularly so it was “bright and shiny”. However, when I visited this student later, I found that the bokken had turned “dull” as he had not been practicing with it. The bokken and jo will help you to focus your ki. As one member of the generation that knew and practiced with O-Sensei, what do you think is the most valuable gift that a teacher can give to a student? Don’t fight. Use ki. Don’t resist. Take ukemi.